The fun new lenticular package features magical tummy transformations on Care Bears favorites Funshine Bear and Cheer Bear. The DVD also features Kid Friendly Direct-Play, which allows children to play the DVD without the assistance of a parent. 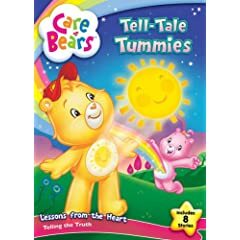 Care Bears: Tell-Tale Tummies will be available on June 9th. below. Last date for entries is June 16, 2009.